Annan athletic will not forget this third round William Hill Scottish cup tie for a long time after they experienced the highs and lows of this fascinating and compelling cup match and both teams will have it all over again at Annan on Saturday after the teams were deadlocked in this eight goal thriller. Annan were the pre match favourites to progress to the next round but Inverurie Locos displayed what the Scottish Cup is all about when a Non League team play a League team. The Highland League side went behind after only 2 minutes but they displayed real character to fight back magnificently to square the match before half time and when the Locos went 3- 1 up Annan looked to be heading out of the cup but as the match entered the last 20 minutes Annan fought back and to their credit got a foot hold on the match to bring the score back to 3- 3 before scoring what looked like the decisive winning goal in the last minute but the Locos were not to be denied with an injury time equaliser to give the highland league team a deserved second chance to progress to the next round. Annan boss Jim Chapman was forced into making changes being without the suspended attackers Smart Osadolor and the injured Josh Todd. Inverurie also were forced to make changes with Martin Bavidge also being ruled out due to injury. Annan opted for a back Three of McNiff, Watson and Swinglehurst with Black being pushed into the middle of the park alongside Flynn with Finnie and Omar playing in the wide berths, Jamie Watson was given his first senior start playing up front alongside Peter Weatherson and Stuart McColm. Annan got off to an absolute flier when after 2 minutes Peter Weatherson blasted the ball into the net from 6 yards after keeper Scott Mathieson failed to deal with Rabin Omar’s corner kick inside. Stuart McColm then had a good opportunity after a good move down the left opened up the Inverurie rearguard but McColms well hit shot slipped past the post. The early promise from Annan failed to materialise and it was the Locos who started to take the game to Annan where they carried a real threat down the right through the impressive Martin Laing and in the centre of midfield where captain Neil McLean posed Annan problems for most of the afternoon. Hart pulled off a couple of good saves to deny a deflected McLean effort in the 27th minute followed by a brave save at the feet of Andy Hunter in the 31st minute. Inverurie had been threatening and it came as no real surprise when Annan’s slender lead was wiped out in the 35th minute when a through ball caught the Annan defence and Andy Hunter with acres of space out in the right set up Neil McLean who hammered an unstoppable shot from 12 yards past Jordan Hart. Annan were toiling to contain Inverurie and were struggling to get any rhythm into their play and when Hunter scooped the ball over the bar in the 44th minute Annan were fortunate to be going in at half time all sqaure. Annan playing down the slight slope in the second half were expected to up their game but the mediocre performance continued with little or no football being played to trouble the Inverurie team and the danger signs were evident in the 48th minute when Peter Watson blocked a net bound Hunter effort. Inverurie went ahead in the 51st minute when Andy Hunter latched on to a low cross from the left to finish with a decisive shot which sent the home support into raptures. Annan then made a couple of changes with the ineffective Black and Jamie Watson being replaced with Sloan going into the middle and Greg McDonald going up front. Annan’s Matty Flynn then had the miss of the match in the 66th minute when somehow he failed to connect on the goal line from Stuart McColms pass across the face of the goal. 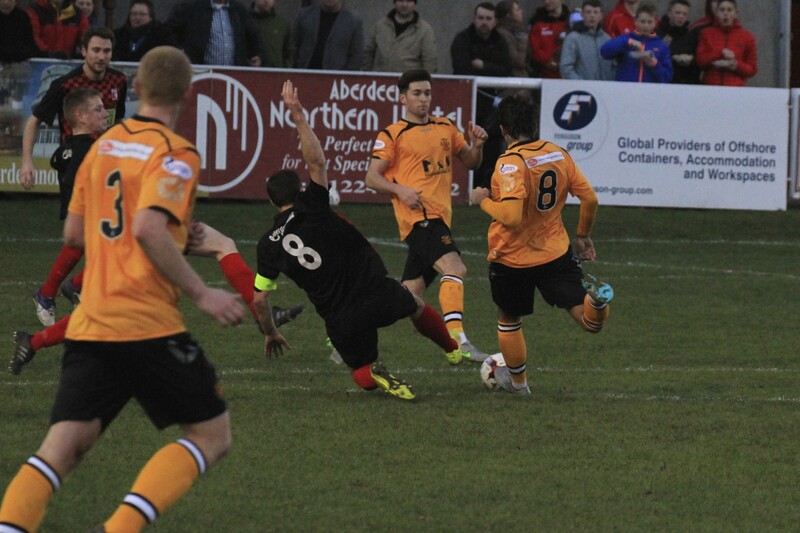 It proved a costly miss as Inverurie went straight up the field and increased their lead to 3-1. Martin Laing who had been a handful all afternoon done the damage skipping past the challenge of Martin McNiff and finishing with a clinical low shot into the net. Inverurie had worked their way into a great position to win the match but within 2 minutes Annan’s most effective player Steven Swinglehurst gave Annan hope when he powered in at the back post to head home Stuart McColm’s corner kick. Annan had a foothold back in the match and it was Inverurie who started to look uneasy as Annan put an onslaught on the home goal. In the 72nd minute Annan struck again to square the game at 3-3 when Weatherson’s back header from a throw in on the right dropped on the edge of the 6 yard box and the ball fell to Stuart McColm who fired in a low 15 yard shot through a ruck of players from 8 yards. Annan had clawed their way back into the match and a minute later Stuart McColm was presented with an opportunity when he was put clean through on goal from a defence splitting Swinglehurst pass but the striker failed to take the opportunity presented to him. The action swung to the other end with Ryan Finnie conceding a free kick on the edge of the area but the opportunity was lost after Annan defended the situation. Inverurie then squandered an excellent opportunity in the 85th minute when McLean lofted the ball past the post after Jordan Hart was left stranded. Annan then looked to have struck the decisive goal to seal the match in the 90th minute when Stuart McColm squared the ball to Peter Weatherson and Annan’s talisman despatched a low shot into the corner of the net. Annan had barely taken the time to absorbe what looked like a match winning position when Neil McLean picked the ball up in the centre circle, skipped past a couple of challenges to the left wing and rode the challenge of Finnie before sending in a cross from the left which floated over Hart and into the top corner of the net. It was the last action in an enthralling cup tie. This was a fascinating and entertaing cup tie and confirmed that the romance of the Scottish Cup is still very much alive and it was one of the most exciting cup matches that Annan have ever been involved in and if both teams can only reproduce half of the same at Galabank next week the fans will certainly not be disappointed. ANNAN ATHLETIC – Jordan Hart, Steven Black (Steven Sloan 60 min), Steven Swinglehurst, Martin Mcniff, Peter Watson, Ryan Finnie, Rabin Omar, Matty Flynn, Peter Weatherson, Jamie Watson (Greig McDonald 60 min), S McColm. Subs not used Blair Currie, Ryan McStay, Bryan Gillfillan, LiamPark. Referee – Steven Reid. Assistants – Jordan Stokoe and Jordan Curran.